Indian Rocks Beach Florida is a beautiful, family beach, perfect for re-charging body batteries that have been spent at nearby Disney World, Universal Studios and Sea World. Indian Rocks Beach is close to Tampa as well so you can fly into the Tampa Airport and get to this lovely Sand Key community quickly. This barrier beach is sandwiched between the Gulf of Mexico on the west and the Intracoastal Waterway on the east. 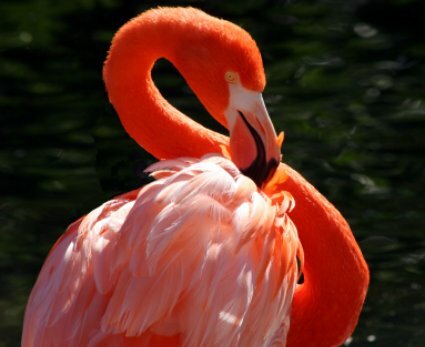 A beautiful Florida flamingo takes my breath away. A lucky few call this Indian Rocks Beach home; others, who wish they could call this home, come here as often as possible to escape less-than-perfect weather conditions at home. Indian Rocks Beach Florida residents are always willing to share their 3-miles of wide sugary sand beach with the less fortunate (those who live somewhere other than Florida). You won’t find a lot of franchises here. Indian Rocks Beach Florida maintains its' small-town feel with a lot of small independent shops and restaurants that are sure to make you feel at-home in no time. Suncoast Seabird Sanctuary, a nonprofit wild bird hospital and bird sanctuary where more than 8,000 hurt and wounded birds come every year as patients to be rescued, rehabilitated and released. You and the family can take a tour and learn how this facility cares for these innocent beautiful creatures. Donations are gratefully accepted. (Link at end of this article with phone number for hours). Close by, Clearwater Marine Aquarium is fun and educational for the entire family. Observe the workers as they care for sick and injured sea animals including dolphins, otters, turtles and other marine life. Since you’re so close to Orlando, visit one or all of the great Disney attractions such as Walt Disney World or Universal Studios. Explore the history of this pristine beach at Indian Rocks Area Historical Society, where the story of the beach and area are told through exhibits, pictures and historical artifacts. A must-see attraction for any history lover. Kids of most ages: Build sandcastles on the beach or check out Pier 60 Park, Playground and Pier. Pier 60 Park has a huge covered playground for the kids featuring one of the world’s largest sand boxes for hours of fun… not to mention that while the kiddies play, dad can enjoy catching some fish off the pier! Eating: For a unique spin on the traditional breakfast food, visit Lighthouse Doughnuts where the bakery has a lot of unique doughnut creations for you to try. Bring your cash to Lighthouse Doughnuts as they don’t take credit cards. For a view of the Gulf, outdoor seating and a unique and upscale menu, check out Guppy’s on the Beach. Sleeping: Cozy up at the Great Huron Inn, located right on the beach or stay in the tried and true Holiday Inn Hotel & Suites Indian Rocks Beach/ Clearwater. Here is a link, as promised, for more information on the wonderful work being done, hours open and seminar possibilities at the Suncoast Seabird Sanctuary.